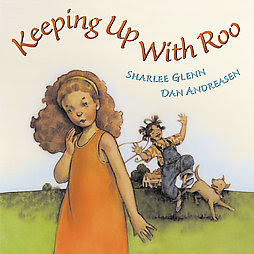 Sharlee Glenn is the mother of five, the wife of one, the sister of six, the daughter of two, the author of four (and counting), the friend of many. She lives with her family in Pleasant Grove, Utah, at the base of Mt. Timpanogos. Her work has appeared in periodicals as varied as Women’s Studies, The Southern Literary Journal, Wasatch Review International, Segullah, The New Era, and Ladybug Magazine. She is also the author of three books for young readers: Circle Dance (a middle-grade novel), One in a Billion (a picture book), and Keeping Up with Roo (a picture book, published by G. P. Putnam’s Sons). A fourth book, Just What Mama Needs, will be released next spring by Harcourt. Recently, I was speaking to a group of 3rd graders about how they could write, illustrate, and even bind their own books to give to their parents or grandparents on special occasions as a really meaningful gift from the heart. One little girl quickly raised her hand. “Jewelry,” she said. I mean, I do write, but not all day long. Not that I wouldn’t like to. It’s just that, besides being a writer, I am also a wife and a mother and a teacher and a volunteer and a church worker and a member of both the PTO and the PTA and a neighbor and a sister and a friend and a . . . . You get the picture. In other words, I’m a human being. Which means I spend most of my time being human. Which means I don’t accomplish half as much as I’d like to. But per Courtney’s request, let me take you through a typical day. Shift #1. Hubby heads to work around 5:45 (when the weather is good, he bikes to downtown Salt Lake. That’s right. All the way from Pleasant Grove. That’s 40 miles, one way. And I’m talking “bike” as in “bicycle” not “motorbike.” What a guy, huh?). Shift #2. I drive the 15-year-old to early morning jazz band at 6:50. Shift #3. I leave at 7:25 to drop the 17-year-old off at high school (unless he has an early morning AP Calculus study group, in which case he goes earlier), then I deliver the two youngest to their respective schools. Between shifts 2 and 3, I make sack lunches for the younger kids (they are at charter schools where school lunch is not available) and try to get the breakfast dishes done and the kitchen cleaned up. Once the early morning taxi run is over, I come home and throw in a load of laundry (yes, I do at least one load of laundry every blamed day of the week, except Sunday. Sad, but true.). Then, if it’s Tuesday or Thursday, I do Power Yoga with Adrienne Reed from 8:00-8:30. On Monday, Wednesday, and Friday, it’s Classical Stretch with Miranda Esmonde-White. This is followed by a half hour on the treadmill (or, if the sun is shining, a 3 ½ mile power walk in the foothills of Mt. Timpanogos with my friend, Lauri), breakfast while reading the newspaper, a shower (actually, a bath most days), and general pick-up around the house. Often, I’ll also try to throw something into the crock-pot for dinner since afternoons/evenings are so hectic. Ideally, I’m now ready to sit down at my computer and do the actual work of a writer, but more often than not I have some other kind of commitment (volunteer time at one of the four different schools my kids attend, church work, extended family responsibilities (my mother-in-law is currently undergoing chemotherapy), or medical/dental appointments (four out of my five kids (so far) have had to have braces and glasses/contacts, so orthodontist and optometrist appointments alone have swallowed up about seven years of my life). It’s also possible that I have a school visit or a writers conference or workshop or critique group scheduled on any particular day. If not, I usually start by answering my email (always, always hoping for something positive from one of my editors or the agent who is currently looking at my middle-grade novel manuscript), logging onto the Segullah editorial table (where I serve as assistant poetry editor), and checking the various listservs and online critique groups I belong to. Then it’s time to WRITE. Most days I try to honor the period from 10:00 to 12:00 as my Sacred Writing Time. Emails don’t count as writing during this time. Neither do letters, church talks, Relief Society lessons, comments on blogs, or shopping lists. By “writing” I mean I either draft something entirely new or actively revise something I’ve already started (and I’m talking here about stuff I intend to send out for publication). I recently finished the first draft—rough and dirty—of my second middle-grade novel, the revising of which should keep me busy for a good, long time. I also have about twenty picture book manuscripts in various stages of development. At noon, I tear myself away from the computer and go down to the kitchen to make myself some lunch. I’m always tempted to take my sandwich or salad or whatever I’m having that day back up to the computer with me, but I’ve had to make an Absolute Rule (much more powerful and binding than a regular rule) about not eating at the computer (I once polished off an entire 14-ounce bag of chocolate-covered raisins without even realizing it while I was deep into a writing project. I’ve discovered that, for me, computer eating equals mindless eating which too often equals extra rolls around the middle). Or, if I’m really in The Zone, I might skip lunch altogether. I love it when that happens-- when I’m so invested in a project, so lost in the imaginative world of my own making, that I lose track of time and space and forget even to be hungry (or to check my email!). My afternoon is filled with more of the above plus business correspondence, submissions, and follow-up queries. And every once in a while I get to engage in the blood-pumping excitement of negotiating new contracts, reviewing galley proofs, tearing open the package of f&g’s that have been sent, overnight express, from my publisher, or discussing details like jacket cover art or dedications with my editor. Ironically, it’s at these times that I feel most like a real writer—much more so than when I’m actually, well, writing. I try to time any errands I may have (bank, post office, grocery store) so that I can do them just before I start the afternoon pick-up/run-around of kids. If it’s, say, Thursday, I take care of my errands, then pick up my 15-year-old at 2:45 and zip him over to The Music School in American Fork for his Little Big Band rehearsal, then beat it back to Pleasant Grove to pick up sons three and four at their schools. Once things have settled down in the evening (after family prayer and scripture study (if it’s a good night), back rubs and bedside chats for the older kids, bedtime stories and songs for the youngest), I usually try to steal another hour or so at the computer, preferably writing and not just chasing myself around the internet. And then, the next morning, we get up and do it all over again. And there you have it. More, I’m sure, than you ever wanted to know. But writing this has helped me remember how much I like my life. It isn’t a perfect life--I have my share of yucky stuff to deal with (mouthy teenagers, migraines, insomnia, dirty socks that end up everywhere except the clothes hamper, cars that continually break down)--but it’s a good life. And one of the best things about it is that I am doing what I always wanted to do. I am living my dream. Gustave Flaubert once said: “Writing is a dog’s life, but it’s the only life worth living.” I guess I would have to agree. How about you? Are you living your dream? *A mid-list author is an author whose books do okay but aren’t break-out bestsellers. It was my 17-year-old son who reminded me that that’s what I am. Me: (thinking about this) “Honestly, I’m not sure if I’d ever want to be really famous. I just want to write books—books that touch people. I guess I’d like my books to be famous.